Check out some clips for the first season of the hit animated series coming to home video this March. 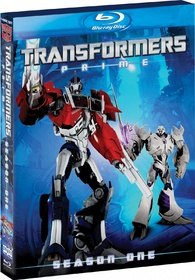 As previously reported, Shout Factory will release 'Transformers Prime: Season One' on Blu-ray on March 6. From Roberto Orci and Alex Kurtzman, the writing team behind the megablockbuster Transformers feature films, and executive producer Jeff Kline comes an all-new series of sophisticated adventures for the Autobots, Decepticons and their human allies that boasts stellar computer animation and an impressive voice cast including Adam Baldwin ('Chuck'), Clancy Brown ('Lost'), Jeffrey Combs ('Re-Animator'), Dwayne “The Rock” Johnson ('G.I. JOE: Retaliation'), John Noble ('Fringe'), Tony Todd ('Final Destination') and Gina Torres ('Firefly'). 'Transformers Prime' deepens the epic mythology of both the Autobots and Decepticons, while starting fresh for a new generation of fans. Optimus Prime, Bumblebee, Arcee, Ratchet, Bulkhead, and many others are back to "roll out" against Megatron's latest attempt to conquer Earth. And Megatron proves to be more powerful than ever, having acquired a rare element that allows him mastery over life itself. 'Team Prime' may be few against the Decepticon hordes, but they find increased strength via bonds forged with three human teenagers. Make no mistake, 'Transformers Prime' delivers heavy metal action, and nail-biting suspense - but it also takes the human drama to levels as yet unseen by the franchise. The 4-disc set will feature all 26 episodes with Dolby Digital 5.1 soundtracks and supplements include: original "making of" special, audio commentaries, featurettes, animatics, and more! -- Including a 96-page Transformers: Prime prequel graphic novel by IDW Publishing! You can find the latest specs for 'Transformers Prime: Season One' linked from our Blu-ray Release Schedule, where it's indexed under March 6.